President Bill Clinton gives us his views on the challenges facing the United States today and why government matters — presenting his ideas on restoring economic growth, job creation, financial responsibility, resolving the mortgage crisis, and pursuing a strategy to get us "back in the future business." He explains how we got into the current economic crisis, and offers specific recommendations on how we can put people back to work, increase bank lending and corporate investment, double our exports, restore our manufacturing base, and create new businesses. 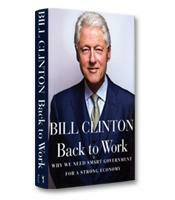 "Our constitution was designed by people who were idealistic, not ideological," writes Bill Clinton in his new book, Back to Work. "There's a big difference." Clinton writes that Republicans and Democrats need to work together to find solutions, but accuses Republicans of being unable to consider any solution that doesn’t fit a strict ideological dogma summarized in three simple words: Government is bad. "Fervent insistence on an ideology makes evidence, experience and argument irrelevant," Clinton writes. "If you possess the absolute truth, those who disagree are, by definition, wrong, and evidence of success or failure is irrelevant." Democrats are not always right, and Republicans are not always wrong, Clinton writes. His point is that "the antigovernment paradigm blinds us to possibilities that lie outside its ideological litmus tests and prevents us from creating new networks of cooperation." For Clinton, these networks of private, public and non-profits sectors are the key to finding solutions to the problems faced by the U.S. and the world. He sees the power of this kind of non-partisan, non-ideological cooperation in the success of his foundation and the Clinton Global Initiative. "Instead of focusing on our differences, we come together to build a world of shared opportunities and shared responsibilities," he writes. "Whenever possible, we collaborate with both government and the private sector to do things better, faster, and at lower costs." In Back to Work, Clinton offers 46 specific proposals intended to increase bank lending and corporate investment and create more well-paying jobs. Some proposals would free up money through measures such as reducing corporate taxes, which are higher in the U.S. than in other countries. For partisan Democratic readers, Clinton effectively demonstrates through charts, statistics and even history (the transcontinental railroad and the highway system are two examples of transformational government investment) that the elimination of government is not the one and simple solution to all problems. 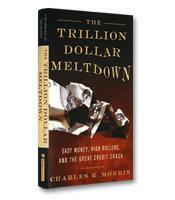 Partisan Republican readers, however, will probably not be convinced by the former President’s arguments and solutions, any more than they were convinced by his successful efforts to eliminate the deficit and reduce the debt. There are always two interpretations for every fact — the reason for the emotional, frustrating battles witnessed in Washington. However, naysayers have been betting against the United States for more than 200 years, and they’ve always been proven wrong, Clinton writes. Continuing to prove them wrong requires, first and foremost, a new attitude. "Success in the 21st century requires Americans to be curious enough to learn from countries that are doing important things better than we are, humble enough to listen and to learn from Americans who disagree with us, smart enough to realize that shared prosperity is a better formula for success and happiness than ‘you’re on your own,’ and big enough to admit we’re all going to be wrong once in a while." With recent polls showing him as America’s most popular politician, there is perhaps no one better positioned to help America move to a renewed sense of unity, cooperation and compromise.